Whenever I am presented with a salad to eat I feel like a little bunny from a Beatrix Potter story. I have ordered salads, such as caesar or nicoise, when I am pretending to be on a diet, and bloody righteous I’ve felt about it as I grazed on the collection of lettuce and other raw, but very good for you, ingredients. Bottom line – salads are not my food of first choice. I’ve spent years sampling salads trying to find that elusive one I wanted to make rather than had to make. The following recipe is known in the family as just ‘the salad’. It is a potpourri of different salads with which I have experimented over the years, each one being a curate’s egg. The salad has become the staple dish in our family now for zonks, and flies off the plate irrespective of whether I am making it just for the family or larger numbers. 1 large Spanish onion (optional, as the family says the recipe doesn’t need it but I prefer its inclusion). Haloumi cheese (if you don’t like Haloumi cheese, and many people don’t, try goat’s cheese instead). Create a base of salad leaves on your serving plate. Slice your capsicums, tomatoes, pumpkin and onion. Put them in a baking dish with olive oil, and add some dried basil and seasoning. Shove them in the oven at 180C and roast. This should take anywhere from 45 minutes to an hour depending how well done you like your vegies roasted. The pumpkin may take longer as we like them very well done for this salad. The vegetables can be roasted earlier and left. I often serve them cold or at room temperature; if you want a warm salad then give them a quick spin in the microwave. 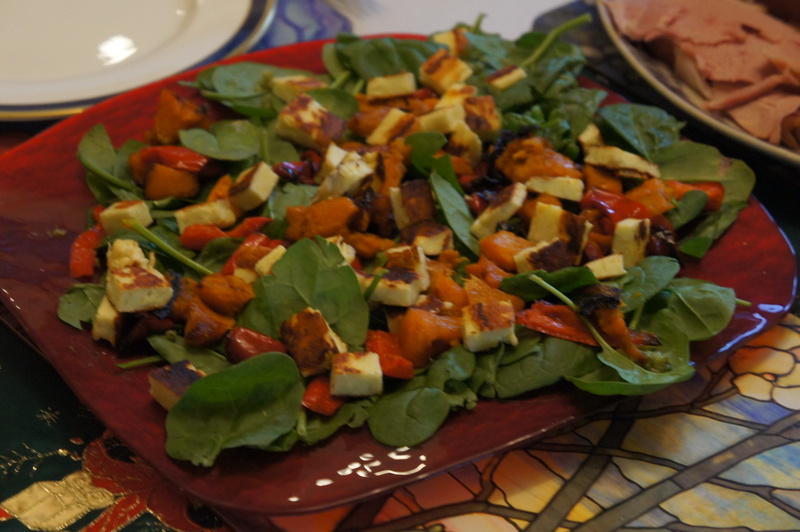 Now days there is always a container of roasted vegetables in my fridge for use in dishes such as this one. Get the Haloumi cheese and dry fry it. When cooked, dice it into small cubes. Sprinkle the basil dressing on the salad mix. Scatter roast vegies on the dressed leaves, and top it all off by scattering the grilled and diced Haloumi (or crumbled goat’s cheese). This dish looks pretty on the plate, and tastes even better. I cheat when I make basil dressing. Sister Ruth, a bloody terrific cook in her own right, first suggested this cheat to me. There are basil pesto dips, such as “Chris’s”, “Wattle Valley” or “Copperpot”, you can now buy at any supermarket. They are usually comprised of the basil paste with additional ingredients including some ground Parmesan cheese and crushed nuts. I use these dips as bases for pesto sauces when I’m cooking last minute pasta or, as in this case, a basil salad dressing. It is the quality and quantity of olive oil that you add to the pesto turning the paste into a sauce or dressing that is the trick. For the salad dressing, it should be a heaped tablespoon of basil pesto paste and a 1/4 cup of olive oil. Mix through. Ultimately it should be according to your taste. You can keep any leftover dressing in the fridge as it lasts for ages. Posted in Food, Politics, Sport, Kitchen, Recipes and tagged The salad for those who hate salads. Bookmark the permalink. I love salad. And this looks bloody gorgeous! I have one I think the salad-averse might like. Coincidentally, it also has a basil dressing, but I make mine fresh (basil, garlic, lemon juice, maybe avocado, all jooshed with a Bamix thingy). The rest is: brown rice, zucchini fried in olive oil with garlic; raw stuff – chopped celery (for crunch), red capsicum, Swiss brown mushies, parsley, shallots or red onion. You can chuck anything in, really, though I don’t use tomato because it makes it a bit soggy. If you don’t use avocado, you can also stir-fry it the next night, and add chilli or Tabasco and a fried egg on top. Lazy woman’s family catering. You recipe sounds like a winner. I have copied it and will give it a go. It will probably turn up on this blog, fully attributed of course.